Thank you for your interest in starting your own gold mine and investing in gold. My name is John Louis and I am adviser for international investment in gold and provider of consulting and guidance service to start your own gold mine and sustainable gold mining business. Since 2002. I have started, opened, registered, incorporated more than 100 international businesses helping worldwide entrepreneurs and businessmen to start their own businesses. Some of those businesses have developed into our own gold mine: Goldivanti LP. In this program, you get to use our mining resources. You basically do not spend time on negotiation, research, but we simply kick-start your production. Usually, people spend months in Tanzania before they can begin anything, most of them try and fail and go back to their home country. We make sure this is not going to happen and your gold mine would be working even if you go back, as we can manage it later and make sure it runs long term. US $22,000 would be really minimum investment, but you would get a working, sustainable gold production, however, this kind of investment is hand-work oriented on processing soft materials. Soft ores have lesser gold content, but still you can make kilograms. We guarantee you will make first 3 kilograms during your training and learning time. You should estimate about 2-3 months to reach that target. US $40,000 or €30,000 would be 9:1 ration of 9 times soft ores and 1 time hard material. You would be able to process mostly soft materials but also about 7-10 tons of hard material per day, as such investment would involve crushers. The next level of investment would be when you employ compressors, excavators, trucks, off-road vehicles and make a larger operation. Once you have got first 3 kg of gold net after expenses, you may move in with large investment. Please let me know, what investment would you like to apply for the operation? By my experience, it is wrong to "try small" if you can invest in excavators, trucks, off-road vehicles and compressors -- which all of it can be bought in UK and Europe, you should do such in beginning. Proper estimation of effort is required to kick-start the production. However, with minimal investment of about €20,000 or US $22,000 it is possible to start your own gold mine. We will make sure you get proper training, guidance and that you produce 3 kg of gold. After that, you may decide to continue yourself, or if we manage it for you, we retain the 20-40% management fee. Our award is one-time payment of 2 kg from your gold mining claim. And only after you have got your 3 kilograms of gold in gold or moneys, net after expenses and taxes. We can offer you to start a productive, your own gold mining business, under my personal supervision until you have produced first five kilograms of gold, and if you like it later, under constant surveillance and personally organized and supervised management. This program is the result of our work and experience in the production of gold, trade of gold and variety of gold related businesses. Start Your Own Gold Mine is for you. We have already started our own gold mining and gold production and it just happens that we have been often asked by new clients to help them start their own gold mining production, which can run by the same processes and methods as our gold mining projects. That is the purpose of this website, to start your own gold mining business. Sustainable and long term profitable business of production of gold. I personally believe that the best investment in gold is having our own gold production. Personally, I would be very happy if I could have someone to lead me and direct the work just as I am offering it to you. My group of people needed about six months just for research and acquiring proper knowledge, and yet another five months just to explore the claims, and acquire joint venture deals. We had to invest a lot to get to the first grams of gold. And we did it. You are not going to follow the long path to success through all the burdens of exploration, self-learning and duration. You are going to be kick-started into gold mining business within 45 days. Yes, 45 days only. Upon your arrival. With the knowledge and experience I have acquired, you are here to learn about the turnkey gold mining solution, so that gold production may begin within 45 days from the start of the project, and we count the start being your arrival. I'm in the business of trade in gold, business of scrap gold dealing and refining of gold, and anyone being in such business do not want to risk with the gold price. 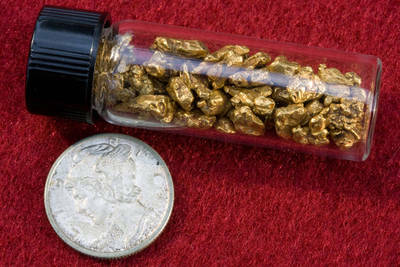 I have decided to open up my own gold mining in order to minimize risks with the gold price. And I was right. In this business, you may have complete control and may monitor and manage the business yourself, or you may decide to choose or to delegate the management to us. It's your decision. Most of all it is recommended that you have a complete insight into the business through our consulting and guidance service. Profits may be substantial, but the business depends mostly on the intention and persistence of its managers. Yes, we do have the necessary amount of intention and persistence. We are here to teach you, demonstrate you, lead and guide you through the first stages of gold production until you are able to properly copy, replicate and continue such gold mining business yourself. You may later choose either to stop, as you will have acquired minimally three kilograms of gold, or you may choose to manage such business yourself in the future, or eventually to delegate the management to our supervised management and earn profits on distance. We have the necessary dose of intent and the necessary dose of persistence in achieving those goals. The aim is a long-term and sustainable production of gold. Earnings may be considerable, in any case, you should be able to produce several kilograms of gold per month, even with a small investment in machinery, equipment, gold recovery technology, facilities, safety, and operational costs. From me you'll get over the next few days and clear instructions on how you can get involved in this business, either passively or actively. During that time, you may learn how to start your own gold mine with our guidance, help, mentoring, step by step program. If you wish to kick-start your business, you may decide to contact us now, otherwise, enjoy the instructions which you are going to receive during next days.